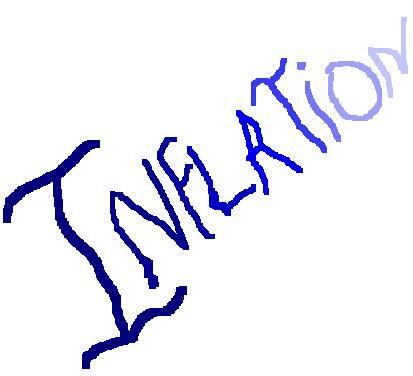 My Finance Times: Inflation climbs to a record 8.75%......Are we experiencing hyperinflation? Inflation climbs to a record 8.75%......Are we experiencing hyperinflation? Latest figures on Friday 13th June suggest prices of commodities are rising and inflation is climbing faster. This leads us to the question : Is India experiencing hyperinflation?? The answer is a definite NO. India has experienced bad times earlier, the worst being the famine year of 1943 when inflation touched more than 50%!! So a mere 8.75 doesn't quite look dangerous. But it can still be. Consider the bank interest rate to be 6% and PF account/ Post Office/ Mutual Fund returns at 8-9%. This means that our money is hardly growing, moreover, value of money is eroding. With wages increasing and input prices (thanks to oil/petrol/gasoline) increasing, prices consumers pay have to increase with the costs of production. In turn we demand higher wages, sending prices higher still. Hence, inflation. Poor people are the worst sufferers because they have all their savings in cash. Rs. 1000 means Rs. 912.50 (converts into a loss of Rs. 87.5 for the poor ......isn't that devastating).Furthermore, oil prices and food prices are rising too and all combined poor people are finding it hard to make ends meet. Most monetarists, economists and analysts believe that increasing interest rates will counter inflation. Granted, it reduces consumer spending and investment(slow growth too). But till when will the Indian government increase interest rates?? Consider inflation at 9%. Can interest rates be sustained at over 9%? What about other developing countries like Vietnam where inflation is 25%( according to latest figures). Can their government increase bank interest rates to 25% ? One solution pointed out is that the RBI(Reserve Bank of India)/Central Bank of any country can increase rate of borrowing and reduced credit to people. Finally, increase the supply of food, oil, commodities to all people. Give food surplus (to some extent) to the poorer strata of the society - hence pushing demand for food down. Following this, China reduced their rate of increase by 20.3 points from April while vegetable prices decreased 15.7 percent. I am all ears to your solutions too! Submit them here! Its 20th June Friday today. News has just come in that inflation has touched a 13 year high record of 11.05 %. This figure was announced after recent research recorded lpg gases prices up by 20% and petrol/diesel prices up 11% too.